Under the tag line of, “You’ve got to be kidding me!” comes this tidbit from Politico. Given their continuing failures in reporting news, CNN is in discussion with changing Anderson Cooper’s 360 program to a game show. We all know that CNN has not been a news channel since the first Gulf War when their lead anchor, Bernard Shaw, had hysterics in Bagdad at the start of the Gulf War I air war. I suppose it’s only reasonable that CNN comes out of the closet and admits it hasn’t been a news channel and moves on. We’ve reached out to CNN for more details and will update here if and when we hear back. CNN, like MSNBC, has drifted so far from reality that nothing they do now surprises me. The Jubilee has come! Eric Holder actually changes DoJ policy in favor of the states. The FedGov will no longer usurp state and local asset forfeiture cases. In many of those cases, the state and local law was more restrictive than federal law. The DoJ would takeover cases then give local PDs a cut-of-the-action. Theft by government order. I’ve never liked asset forfeiture until the accused has actually been convicted and sentenced. Even then the laws are too broad; seizing accounts and assets unrelated to the actual crime(s). In a stunning announcement last week, Attorney General Eric Holder announced the Department of Justice would immediately stop “adopting” state civil asset forfeiture cases. Attorney General Eric Holder’s announcement came exactly one week after leaders on Capitol Hill called on him to halt the controversial program as a step toward broader reform of the nation’s civil forfeiture system. Before today’s announcement, federal agencies could take over, or “adopt,” forfeiture cases from local or state law enforcement agencies. In other words, state or local law enforcement personnel would seize property and then turn it over to the federal government to process. Pursuant to agreements with the federal government, once the property was successfully forfeited in federal court, the originating state or local agency got a portion of the proceeds, potentially as high as 80 percent. That money had to be used for law enforcement operations, placing it beyond the control of local governments and state legislators. The program became the subject of controversy for effectively allowing local agencies to circumvent restrictive state laws in favor of the potentially more lucrative federal route, raising serious federalism and good government concerns. Even where states had strong procedural safeguards for property owners or limitations on the use of forfeiture funds, law enforcement could partner with the federal government and use federal rules to seize property and make use of the profits. Apparently responding to these concerns, the attorney general’s new policy bars federal authorities from adopting local or state seizures of “vehicles, valuables, cash and other monetary instruments.” The AG was able to make this change unilaterally because the statutes underlying federal civil forfeiture made the equitable sharing payments optional. The Department of Justice has the authority to craft, and to change, the rules of the program. The Treasury Department, which operates its own forfeiture fund, announced its forfeiture operations will conform to the same guidelines as those laid out by Holder. The article continues with an explanation of exceptions under Holder’s new directive. All-in-all, it’s a step in the right direction. Ya just gotta love Dave Clark. Who’s he? He’s the black, conservative, Milwaukee County Sheriff who won his last election despite the efforts of liberals who hate black conservatives. He does not hesitate to make his opinions known. This time the subject was Al Sharpton. Former Speaker of the House, Tom Delay. Tom Delay may be out of Congress, but the libs failed to defeat him. The Texas Supreme Court ended the Travis County (Austin, TX) democrat prosecutor’s vendetta against Delay. He’s back now with a review of Obama’s SOTU speech earlier this week. I found President Obama’s State of the Union address this week infuriating — and exhilarating. It was infuriating for all the usual reasons. For all the talk that this time things would be different, in the first State of the Union speech since the American people repudiated his entire agenda we got the same old Mr. Obama, arrogant, disdainful, defiant of the new Republican majorities and of the voters who sent them to Washington. Had there been a referee on the premises, he would have thrown a flag for taunting. The president either doesn’t know or doesn’t care that his party badly lost the elections. He’s not listening to the American people, as was evident in the very first minutes of his speech when he laid out the same old tired agenda that dragged down the Democrats in the first place. When President Clinton got a similar repudiation in the 1990s, at least he had the smarts to cooperate — sometimes kicking and screaming — with our new Republican majorities to get items like welfare reform passed. Things worked out so well that now Mr. Clinton brags about the things we forced him to accept. That’s clearly not Mr. Obama’s way. What we got instead was one of the most misguided, frankly unconstitutional speeches ever given by an American president. The president called for universal child care, gender pay equity, guaranteed paid sick leave for workers, a higher minimum wage, free community college and new rules to make labor unions stronger — not one of which is the responsibility of the federal government under the Constitution. Then he laid out all the things he’s ready to veto if he doesn’t get his way — not exactly the bipartisan outreach that his advisers said was coming. Even more infuriating — if possible — was Mr. Obama’s boasting about how far we have allegedly come under his watch. He bragged of bringing down the federal deficit in recent years when it was his uncontrolled — and unconstitutional — spending and taxing that ran up the deficit and debt in the first place. The official unemployment rate is down, but only because 90 million Americans have grown so discouraged that they’ve dropped out of the labor market altogether. The president says he wants to turn his attention to stagnant wages and income inequality, apparently oblivious to the fact that wages aren’t going up precisely because there is a vast army of nonworkers out there saturating the job market. And income inequality will never be “fixed” by taxing the job producers more and giving the money to people who aren’t working. That approach has failed everywhere it has been tried. The president’s victory lap was even more incredible when you consider the full plate of crises beyond our borders, from Russia and Iran to Yemen, Nigeria and Syria — the easily foreseen consequences of an administration that brags of “leading from behind.” The president claims the “shadow of crisis” has passed, but that’s not true to anyone who has been paying attention. So why the exhilaration, you ask? The more I listened to the speech, the more I was convinced that the president is handing the Republicans an incredible opportunity. He’s not backing down from his disastrous progressive agenda, and that means conservatives cannot afford to back down from theirs. New Sen. Joni Ernst struck a nice, hopeful tone in her official rebuttal speech, but building the Keystone pipeline and getting more help to vets is not a full agenda. The joint House-Senate Republican retreat last week was another missed opportunity to pre-empt the president’s liberal agenda, to put a true constitutional conservative program on the table and force this president to react. But Mr. Obama’s speech made it crystal clear that Republicans have no alternative to confrontation, a clash that should last through the 2016 election. Facing a delusional and defiant president, this is no time for conservatives to play small-ball. We need a bold agenda that presents an alternative to the left. We need real, pro-growth tax reform. We need to repeal Obamacare — now. We need to slash spending. We need to defund the president’s illegal executive actions, starting with his amnesty for illegal immigrants. We have to show we respect life and traditional values. There can be no debate about it any more. Barack Obama has made it unmistakably clear he wants a fight. We should give him one. …that the 2nd Amendment does not protect hunting nor hunters? According to one Federal Judge, it does not. 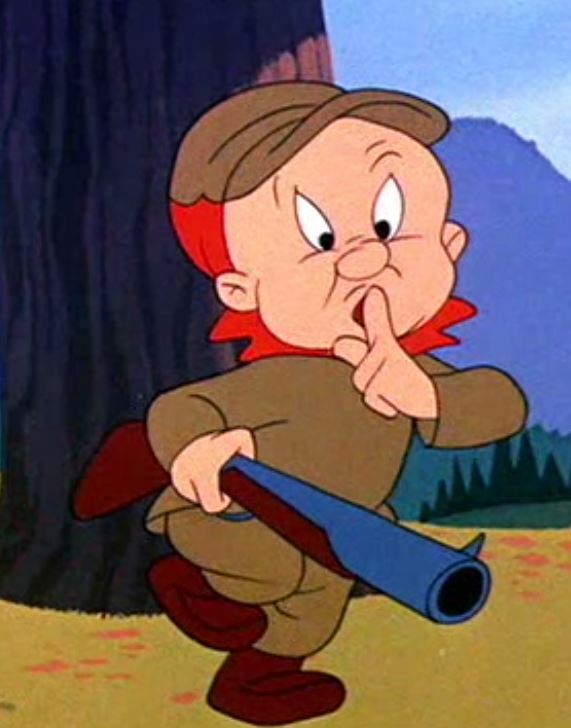 Have you heard the term, “Zumbo” or “Fudd?” It refers to the cartoon character, Elmer Fudd. Second Amendment rights activists use it in another form. Fudd: Slang term for a “casual” gun owner; eg; a person who typically only owns guns for hunting or shotgun sports and does not truly believe in the true premise of the second amendment. These people also generally treat owners/users of so called “non sporting” firearms like handguns or semiautomatic rifles with unwarranted scorn or contempt. A legal case about hunting came before a Judge. The hunters attempted to use the 2nd Amendment in their case. The Judge ruled the 2nd Amendment didn’t apply to hunting. “Fudd” isn’t exactly a term of endearment. Fudds are generally uninterested in the Second Amendment, and are therefore the favorite of anti-gun politicians and the news media, like this collection of Fudds in a recent Jamie Tarabay article used to attack the National Rifle Association. They could generally care less about fighting for gun rights, because they assume that their guns are safe. How is that working out for you now, Elmer? A federal judge on Wednesday dismissed a lawsuit by a hunters’ group that had challenged Pennsylvania’s long-standing ban on Sunday hunting, saying she saw no proof the hunters’ constitutionally protected rights were being harmed. Kane said she could find no proof that courts have extended Second Amendment protections to include recreational hunting. She also found that the hunters could not prove that the law unfairly discriminated between classes of hunters or that the ban on Sunday hunting violates their religious freedoms. As stunning as this is for the Fudds, the ruling must be even more perplexing for gun control cultists. They’ve spent the last 30 or more years arguing that if the Second Amendment applied at all outside of their collectivist interpretation, then surely, the Second Amendment only applied for the purposes of hunting. Now a federal judge has knocked over that strawman, and stomped that sucker flat. It’s going to be interesting to see if this ruling registers with the gun controllers—my guess is that they’ll ignore it entirely, since it is inconvenient—but even more interesting to see if this has any effect on the Fudds, who are probably going to find out that they aren’t the “protected species” that they always assumed that they were. When you hear hunters support gun control, tell them about this. They have as much invested in a strong 2nd Amendment as do the rest of us. By this time next week, the 40 and 60watt incandescent light bulb will be illegal—another strike against us by liberals (and a ‘Pub) utilizing pseudo-science. We are being forced, at the point of the federal ‘gun’, to, once again, buy products we don’t want. In this particular case, it is expensive compact florescent light-bulbs (CFL) and LED bulbs. I received a ‘sample’ CFL in the mail. It was supposed to replace my usual 60watt bulb. The sender, our local power company, said the bulb would last longer and be cheaper over the long run. The bulb lasted less than a year, the same longevity my 60watt incandescents, and, as I read the accompanying material, would turn my home into a toxic waste dump if I broke the CFL. CFLs contain mercury, a heavy-metal, toxic element. Not only that, I couldn’t drop it in the trash when it dies. What am I to do with a dead CFL? Sneak out in the middle of the night and toss it in a dumpster somewhere, I suppose. On top of it all, the LED replacements are more expensive. They may last longer, but the bluish tinted light is unnatural and frankly, strains my eyes. The Heritage Foundation released a reminder today and this continuing federal tyranny. The motivation behind the bans of incandescent bulb was not efficiency. It was nothing more than a federal power-grab. 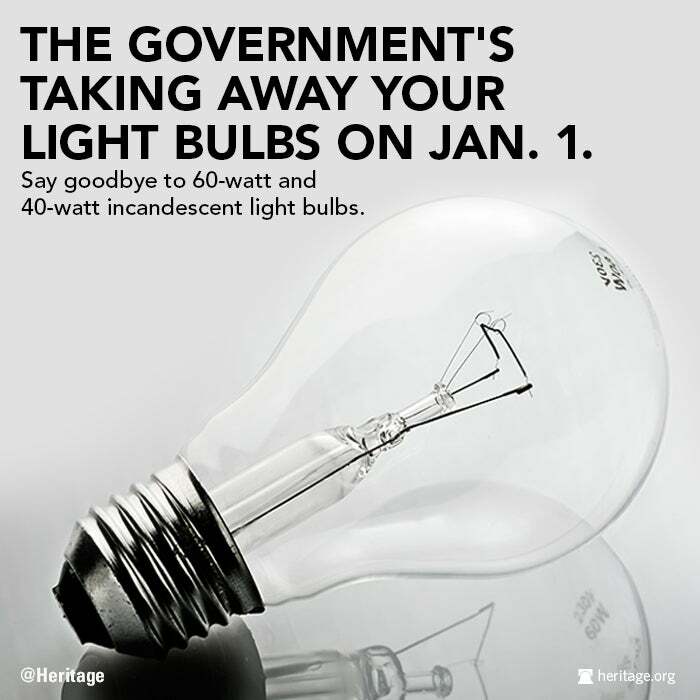 If your New Year’s resolution is to change your light bulbs, don’t worry—the federal government’s here to help. Beginning January 1, 2014, the federal government will ban the use of 60-watt and 40-watt incandescent light bulbs. The light bulb has become a symbol in the fight for consumer freedom and against unnecessary governmental interference into the lives of the American people. In 2007, Congress passed and President George W. Bush signed into law an energy bill that placed stringent efficiency requirements on ordinary incandescent bulbs in an attempt to have them completely eliminated by 2014. The law phased out 100-watt and 75-watt incandescent bulbs last year. Families understand how energy costs impact their lives and make decisions accordingly. Energy efficiency has improved dramatically over the past six decades—long before any national energy efficiency mandates. If families and firms are not buying the most energy-efficient appliance or technology, it is not that they are acting irrationally; they simply have budget constraints or other preferences such as comfort, convenience, and product quality. A family may know that buying an energy-efficient product will save them money in the long term, but they have to prioritize their short-term expenses. Those families operating from paycheck to paycheck may want to opt for a cheaper light bulb and more food instead of a more expensive light bulb and less food. Some may read this and think: Chill out—it’s just a light bulb. But it’s not just a light bulb. Take a look at the Department of Energy’s Federal Energy Management Program. Basically anything that uses electricity or water in your home or business is subject to an efficiency regulation. When the market drives energy efficiency, it saves consumers money. The more the federal government takes away decisions that are better left to businesses and families, the worse off we’re going to be. I’m back, after a brief hiatus. I’m have been having some health reviews—test, physicals, etc., one of those things everyone should do on a regular basis. I’ve been lax. I can’t remember when I had a complete physical. I have learned that physicals aren’t completed in one day. No, it’s one test here, another test there, some can be done with a blood test—and more than once when they forget to check off a particular item to be tested. Some are embarrassing, like mine yesterday. That one went well and I won’t need to repeat that one for five years. All this has disrupted my schedule. I hope, now, the disruptions will become fewer…and less often. I see the…I’m at a loss what to call them. They are dems, of course, but also more. They’re libs, too, but not just being liberals. Infiltrators? Yes, that, they are. They’ve been infiltrating government and our public institutions since the 1930s. Communists? That’s, while accurate, is blasé. I believe Marxists is the current term. Usurpers? That’s what they want to do. What do you call those who wish to destroy our country, heritage, our republican form of government, our liberty? A good question. However, we cannot deny that they exist and have an agenda. We see more and more evidence everyday, from the lies about Benghazi, the overt support for radical Islamics inside and outside the government, the attacks on Christian heritage and conservatism, using government agencies to intimidate political opposition, using government to coerce individuals to submit to bureaucratic regulations, many that may have no supporting law. Yesterday, another piece of clandestine government was uncovered. A separate, secret layer of communication outside the official means of communication within government. Federal law requires all emails in, from, between government agencies to be archived and available to the public via FOIA, Freedom Of Information Act. Obama and his faction created a secret communication system, an illegal system, using a private e-mail platform and refused to make those e-mails public as required by law. Unless, of course, those wanting the emails pony-up $1,000,000…maybe. We, here in Cass County, have had experience with clandestine government. With the election of responsible Commissioners last Fall, our county government is restoring trust in our local politics. In earlier years, county government was government by oligarchy. A small group, of both parties, played fast and loose with contracts, money, and some actions appear to have been fraudulent and those involved guilty of conspiracy. Those allegations are under investigation by a number of agencies including the FBI. Now, look at the changes that have been made to make county government open—and responsible to, county voters. County Commission meeting are regularly scheduled and announced in advance. Information packets of business to be conducted and agendas are released before commission meetings including supporting documents of the topics to be discussed. Commission meeting minutes are posted publicly and available on CDs for a small fee. The county clerk is required by law to record the minutes of commission meetings. However in prior years, the minutes were frequently late and their contents did not always agree with the memories of those meetings from spectators. In some instances, the minutes were altered, after the fact, by request of some commissioners, some have claimed. Those claims have been echoed by some of the county’s elected officials. How different is our county government to that of the FedGov? A local government where we have elected officials dedicated to open government compared to the one in Washington, DC, where both parties, in the Administration and in Congress, work diligently to conceal their true motives and actions. None of the activities being disclosed recently in Washington is surprising. We know the agencies and policies have been in place for decades—supported by both parties. The question now is how can we remove those impediments, remove the obstacles that hinder our liberties and our ability to reduce the power of federal agencies, and make government responsible to citizens? That is a question that I have do not have an answer.